Dubai, UAE, 1st April 2019: – This spring, GUESS is proud to launch ‘GUESS Vibras', a vibrant capsule collection designed by multiple Latin Grammy award winner, J Balvin. The collection is set to launch March 27th, 2019 in GUESS stores. 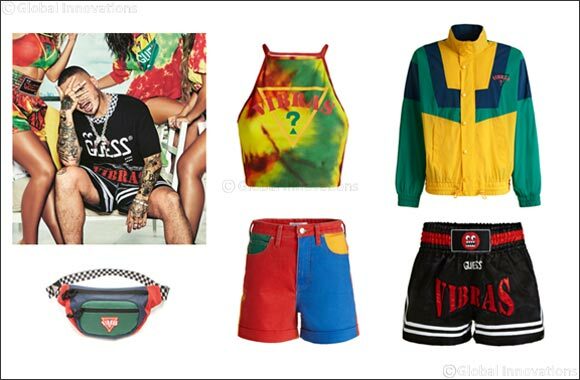 The ‘GUESS Vibras' collection, which is inspired by Balvin's chart-topping “VIBRAS” album, includes a selection of ready-to-wear and accessories for both men and women. Balvin's personal style and colorful risk-taking aesthetic is infused within each piece. His hands-on design input makes this collaboration for GUESS another standout, bringing with it global appeal. The women's collection offers a series of oversized cut-off cropped tee's, bodysuits, bandeaus, tank tops and track pants in red, yellow, white, hot pink and green hues. Matching color-blocked cut-off denim shorts and vest in royal blue, golden yellow, deep red and green are the stand out pieces of the capsule collection. The men's collection also offers color-blocked denim and vibrant track suits that lend a relaxed feel. Oversized men's tee's dipped in red, yellow and green tie-dye are seen alongside multi-striped shirts stamped with the “VIBRAS” album artwork and pair well with the kickboxing Vibras shorts. The GUESS Vibras collection also offers a variety of swimwear for both men and women in a bright and bold color palette that can be accessorized with 12 eyewear styles, socks and a multi-color color-blocked fanny pack equipped with a checkerboard guitar strap.